Click on Help for the see the connection instructions. Connect to the ECU following the connection instructions provided in the Operating Manual. Once back to the previous window, Click on OK to display the programming menu. 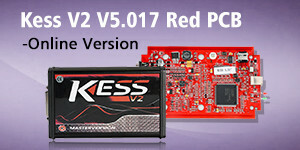 2 Backup – To make a full backup of the ECU data. In addition to the whole file, you can also save a file for each component on the ECU and/or the file containing the maps for engine managements. 3 MICRO/EXTFLASH/EEPROM – Components on the ECU. To read/write a single component, remove the check mark from the Backup/Restore box and select the component. It is possible to read/write only the components in green. For more clarity, the words “Maps” in parentheses is indicated next to the component containing the maps. 4 Restore – To restore the backup file on the ECU. 5 Patch – To enable the serial programming via OBDII on some ECUs (only available for some plug-ins Tricore). 6 Status bar – Percentage of progress of the read / write procedure. 7 Status window – To display messages about the ongoing operations. 8 ID – To display information about the identification of the ECU. 9 Maps – In some cases, if allowed by the protocol, you can see a white check box labeled “Maps”. This box allows you to save a special file which must be used if you wish to modify the vehicle performance, on pain of improper operation of the vehicle and a possible failure and block of the ECU. Choose the right family by using the Vehicle buttons or the Protocols button. 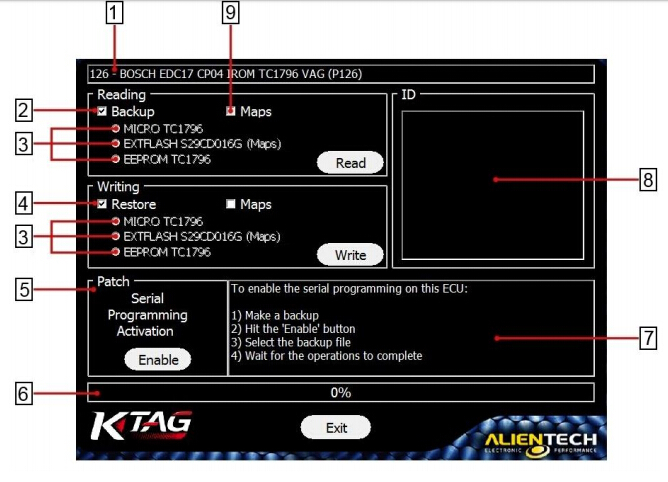 Click on Read to get a backup file of all ECU data. that you do not need to re-read the ECU. Remove the check mark from the Backup box. Choose the component you want to read. available, check the white box Maps. Click on Write to restore the backup file to the ECU. Remove the check mark from the Restore box. Choose the component to which you want to write the modified file.